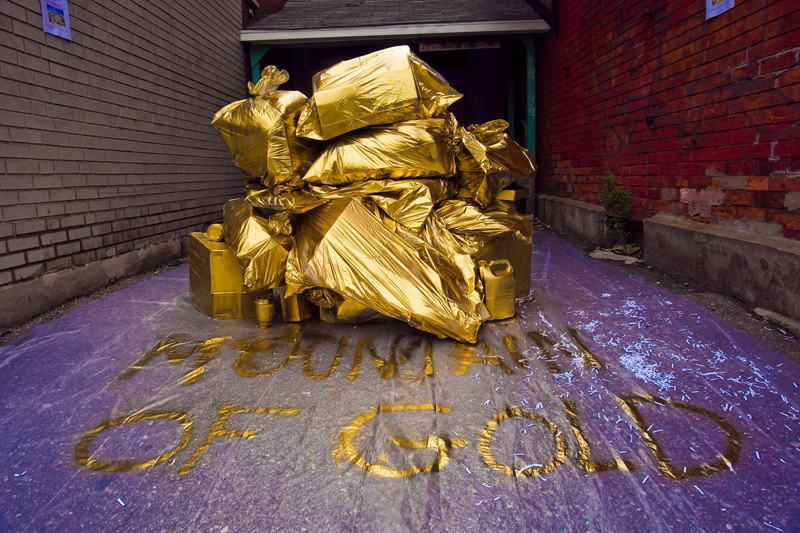 The first installation, “Thank God for the Weather” was created especially for Nuit Blanche Ottawa 2012 — to make a bold, accessible focal-point for the Wellington area. The projection is composed of a dynamically changing sky that darkens in conjunction with the falling night. The sky fills with cartoon-like clouds that move faster or slower, depending on Ottawa’s actual real-time wind speed. Twitter messages — generated in real-time through audience interaction — fly by with the clouds. Additionally, key words from Tweets, like “beautiful” and “nuit blanche,” trigger the appearance of special animations, such as rainbows, lightning bolts, or logos from local businesses. This captivating artwork directly reflects the local environment of Nuit Blanche both literally — by controlling the sky color and clouds from weather data — and figuratively by displaying public sentiment of the event expressed on Twitter. Everyone is encouraged to interact with the animation through their Twitter accounts by using the hashtags #NBO12 or #NBO2012. The installation will only be running on Saturday, September 22, staring at 6 p.m. to 2 a.m. Check it out while you can! 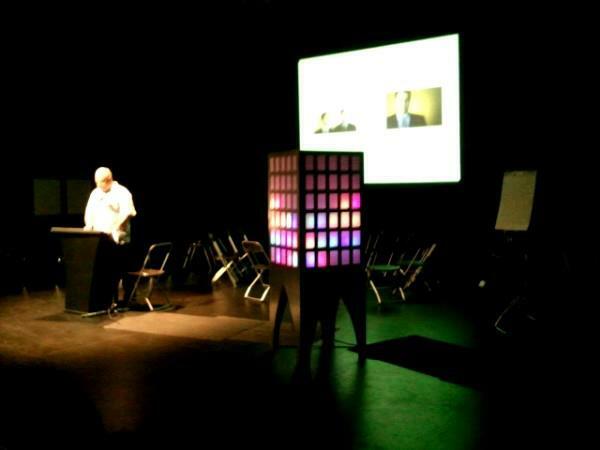 The second installation entitled “Color Clicker” is a showcase for Architecture Week 2012, taking place September 24-30. This interactive, “data driven” piece allows users to control the color of the building’s lighting through their smartphones. Users click on a QR code that brings them to a simple web application where they select the lighting color they’d like to see displayed on the building. The lighting instantly changes to the color selected. It also shows a history of the average colors selected over the event, to serve as a visual indicator of audience preference. 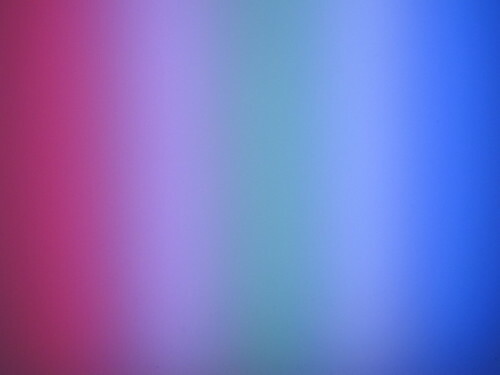 When nobody is interacting with the piece, the previously selected colors cycle through in an animated fashion. This dramatic, but temporary installation will only be running during the evenings of September 24-29. It can be seen at St. Brigid’s Centre for the Arts (302 St Patrick St.). Enlighten yourself by illuminating an old church! These projects are graciously supported by The Ontario Arts Council, Artengine, Wellington West BIA, Lumilux Lighting, Leviton Lighting, the Great Canadian Theatre Company, Morris Home Hardware, and 120 Holland Lofts. The official press release is available in PDF here, including Andrew’s contact info for media requests. Keep reading for more on the whole “sharing” process . . .
Today I gave the above presentation to a group of 7-9 year olds, as part of an engineering/science camp called Virtual Ventures at Carleton University. My goal was to show the kids how I apply engineering to fun and creative ends for my art and music projects. While the actual slide show is brief on info — it was merely a backdrop for a live demo of several of the projects — it serves as a nice little review of a bunch of projects that aren’t fully documented yet. The slideshow is also available as a PDF here. 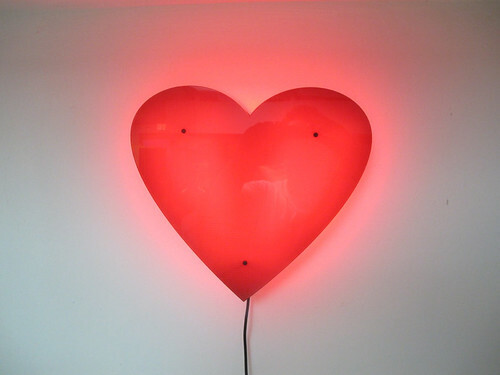 A client contacted me wanting a red, blinking, heart-shaped LED array. 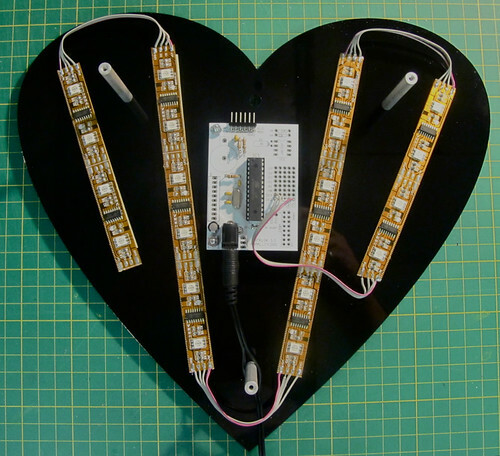 Since my production schedule didn’t afford me the time to design, assemble, and program a heart-shaped LED matrix at his desired size of about 10″ x 10″ for his Valentine’s Day deadline, I proposed a back-lit acrylic heart, to which he agreed. The acrylic panels were designed w/ Inkscape, and cut at Artengine on the recently acquired laser cutter. The client wanted a “blinking red heart” so I programmed the LEDs to “beat” at a slowly changing rate, and also added an occasional “chase” sequence. The programming was expedited thanks to the useful and full-featured demo code provided by Adafruit. After seeing the demo video, the client enthusiastically approved the programming and the piece was shipped in time to arrive for his Valentine’s Day gifting. 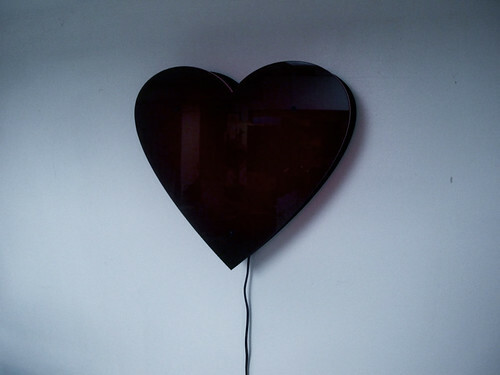 I’ve since added the heart lamp as an offering on Etsy, and it was covered by Wired’s Design Blog. Chinatown Remixed is an annual, art festival in Ottawa’s Chinatown district. For one month each spring, the merchants and restaurants of Chinatown welcome artists’ exhibitions and performances. Having exhibited lighting installations back in the 2010 and 2009 festivals, Deb and I wanted to try something different from, and more spontaneous than our usual “plan and execute” lighting approach. After a conversation with one of the primary organizers, Don Kwan of Shanghai Resto, we did indeed come up with something different for the 2011 edition (May 15 – June 15). Read on for all the details . . .